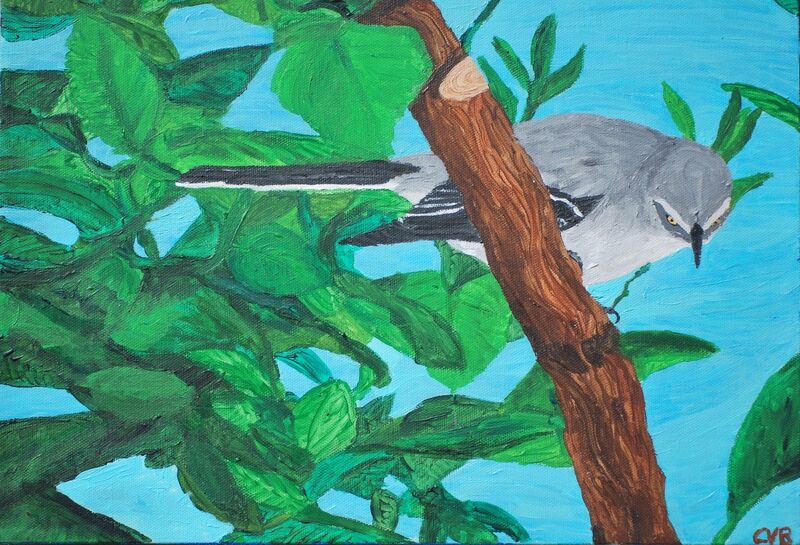 I took the photograph which I based this painting from many years ago, in my childhood yard in Peoria, Arizona. This painting was sold to a friend of mine, who works for a charity in Florida--the idea being that it would be auctioned off as a fundraiser. Since the auction hasn't happened yet, I have no idea whether it will work or not. That being said, Mockingbirds are amazing songsters, and despite their tendency to imitate car alarms, are pretty awesome. The title, of course, is a reference to the style of classical music that involves repeated notes in a pattern; somewhat akin to the pattern of a mockingbird's song. That, and I once heard one in my old neighborhood imitate a piano--possibly this same individual. It seemed pretty much foregone that I'd have to reference that incident with the title for this piece. Also, that being said, I'd rather hear mockingbirds at midnight, than Robins at 3 AM. At least Mockingbirds vary their songs a bit.